The planet's biggest pillar-less dome, built without a professional architect's design, housing 54 massive bronze statues of some of the greatest leaders of humanity as a mega monument to world peace, has come up in Pune. It is the outcome of 13 years of sheer dedication and untiring efforts against all odds by a teacher, Dr. Vishwanath Karad, who was deeply inspired by the teachings of apostles, saints, philosophers and scientists down the ages. "Vice-President M. Venkaiah Naidu will dedicate the Sant Dnyaneshwara World Peace Prayer Hall and Library, or the World Peace Monument to mankind, on October 2. A four-day World Parliament with 110 speakers and thousands of delegates from around the world shall speak on a wide spectrum spanning the spiritual and scientific realms over different sessions," Karad told IANS. These are housed in a 62,500 sq ft magnificent monument at the Vishwarajbaug Campus of the MIT Group of Institutes, under the world's largest pillar-less dome. The World Peace Monument dome has a diameter of 160 feet, compared with the Vatican Dome's 139.6 feet, and stands 263 feet tall with a bell hanging from the centre, and the prayer hall is of around 30,000 sq ft. Among the statues are: Gautam Buddha, Jesus Christ, Mahavir, Moses, Guru Nanak and Mahatma Gandhi; intellectual giants like Confucius, Adi Shankaracharya, Aristotle, Aryabhatta, Socrates, Plato, Galileo and Copernicus; philosopher-saints like Dnyaneshwara, Tukaram, Abdullah Shah Qadri (famous as Baba Bulleh Shah), Francis D'Assissi, Peter, Mother Teresa and Kabir; and scientists like Albert Einstien, Thomas Alva Edison, C.V. Raman, Jagadish Chandra Bose and Marie S. Curie. The statues — weighing between one-and-half tonnes to two tonnes, and up to four metres tall — have been painstakingly crafted by the renowned 93-year old artist, Ram V. Sutar, of Maharashtra, and inaugurated in phases since August 15, by some of the most eminent Indian personalities from different fields. "The top of the dome here comprises another world first — a temple of Goddess Saraswati, symbolising knowledge — and embodying the underlying spirit behind this entire monument, which is accessible by a massive stairway," Karad said. Explaining the work, he said that these great apostles, saints, sages, seers and scientists of India and the world have had "a tremendous impact on my mind" and he wanted to help people understand and realise the "True Nature of the Self". 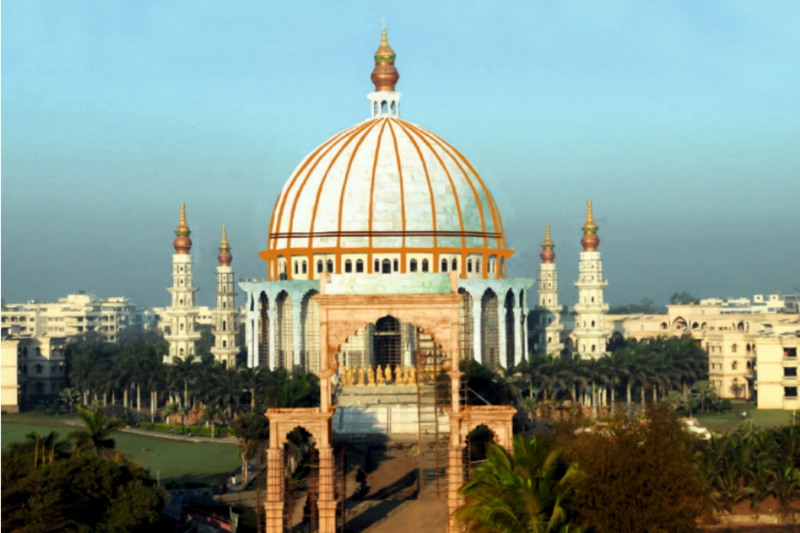 On the occasion of Mahatma Gandhi's 150th birth anniversary, the majestic marble dome, which is a vision of Karad's amalgamation of Spirituality and Philosophy for the welfare of mankind, shall be thrown open to people by Naidu. Hailing from a poor peasant family, Karad, 77, is the Founder-President of the MIT World Peace University besides MAEER's MIT and Director General of World Peace Centre, all in Pune. It was in 1958 that a young Karad, living in Rameshwar-Rui village of Latur, in central Maharashtra, was thrilled to buy his first bicycle costing Rs 159. He attended a makeshift school that was actually a cattle-shed and when the cows went out for grazing each morning, the classmates would clean up the place so the classes could be conducted. The school ended daily with the sounding of bells -- tied to the cows returning from grazing. As a teenager, Karad once went to a bookstore in Pune and while the assistant searched for a book on maths, he happened to see a book by the great Indian philosopher, Narendranath Datta, later world-renowned as Swami Vivekananda. "It was a chance encounter with Swami Vivekananda's works and his words (that) created a deep impact; I went on to read the preachings of Sant Dnyaneshwara and Sant Tukaram, among many others, and realised that they were some of the most amazing philosophers," Karad reminisced. Since that day, he always carries a copy of Swami Vivekananda's teachings in his pocket and reads them whenever he gets the time. The entire complex is set on the property formerly owned by the legendary Bollywood actor Raj Kapoor, along with his imposing memorial, and on the other side is a music school run by the renowned Mangeshkar family. Humility personified, Karad dismisses all credit, saying the monument just happened with him acting as "an instrument" with Saint Dnyaneshwara's blessings, and with the help of several hundreds of artisans from Rajasthan and other places toiling round-the-clock. "The world is one family — 'Vasudhaiva Kutumbakam' — which is an ancient Indian concept. My humble attempt is to create an edifice befitting the glory of Mother India," Karad said.